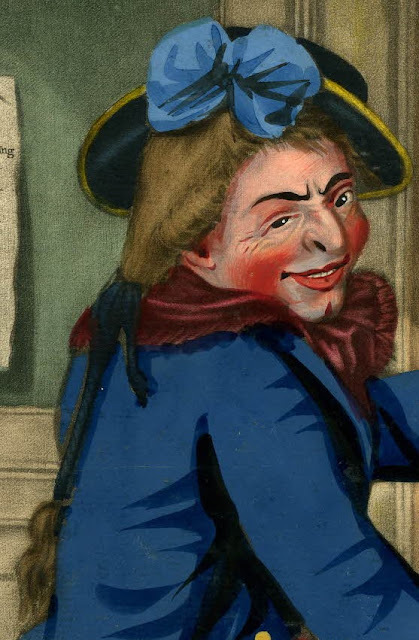 The True British Tar, Carington Bowles, 1785, British Museum. Beyond the window lies a ship at anchor, but clearly our sailor is a bit more focused on the sacks of Spanish dollars he's procured. His table is scattered with coins and bedecked with bottles of Madeira. Lying against the box on which he sits is a neglected pipe, spilling its flames and smoking worryingly. 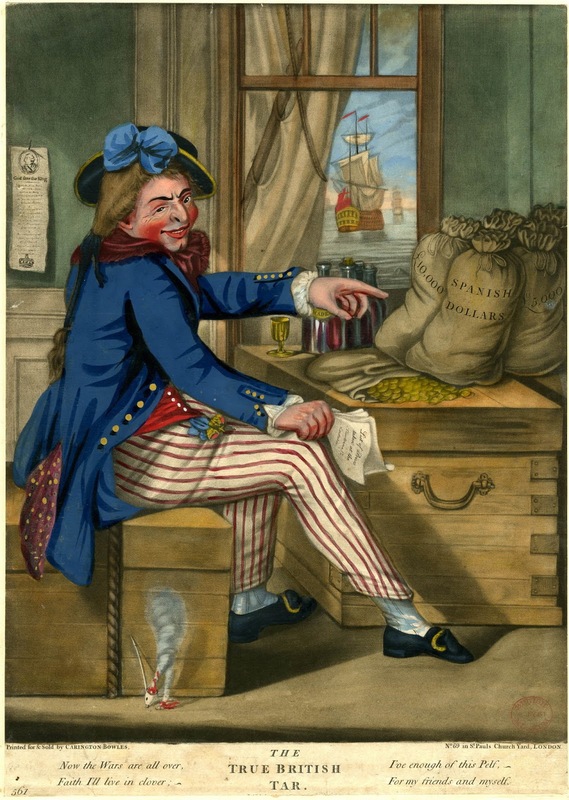 Our mariner wears a round hat lined with gold tape, and decorated with a blue bow (typical of works by Carington Bowles). Flowing from beneath is a wig with a long, tightly bound queue. Sailors of the eighteenth century wore their hair short, until just about this period when long and tightly bound queues begin to appear alongside should length and shorter hair styles. This is the earliest image I'm aware of that clearly shows a common sailor with a long, tightly bound pigtail or 'rattail.' His neckcloth is a sort of burgundy color, and fringed at the edges. The jacket itself is blue, but it is impossible to tell if it is single or double breasted. Either way, it has brass buttons on both the front and the slash cuffs. Out of the jacket pocket, or perhaps spilling out through a rear vent, a burgundy handkerchief spotted in yellow hangs loose. 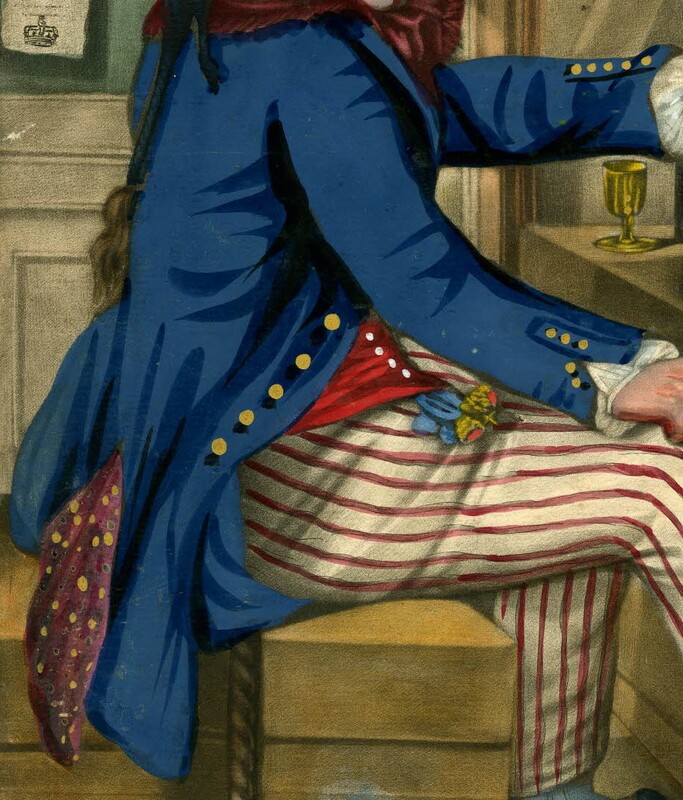 His red waistcoat has white metal buttons, and a colorful blue ribbon and fob extends from beneath it. Red striped trousers lead down to clocked stockings, pointed toe shoes, and yellow metal oval shaped buckles. The straps of his shoes are trained "sailor fashion." Kyle, what did they use to "tar" their hats? Or is it the obvious? LOL Thanks. The tar used at the time was pine tar, which becomes viscous at a relatively low temperature. This is doubly true when compared with the coal tar of the industrial revolution (when you see the birth of tarpaulin hats) and modern petroleum tar. 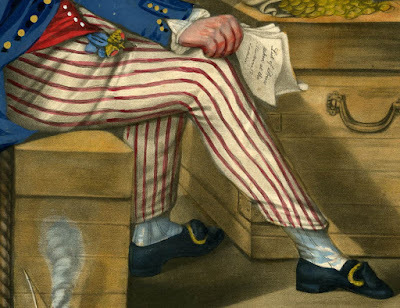 Basically, tar bubbled and ran much more easily in the eighteenth century, and so sailors were often coated in the stuff unintentionally. Thus the nickname "tar."